The Trump administration on Thursday unexpectedly shot down Idaho's effort to let insurers sell health plans that don't comply with the Affordable Care Act's coverage mandates, thwarting conservative efforts to unravel the law's consumer protections directly for now. But CMS Administrator Seema Verma indicated that Idaho and other states could achieve the same goal by refashioning such noncompliant health plans as short-term products, which the administration would allow under a controversial proposed rule. HHS Secretary Alex Azar told insurers Thursday that the Trump administration will do what it can "within the law" to let insurers offer more affordable plans that don't meet ACA requirements. In a letter to Idaho Republican Gov. Butch Otter and state Insurance Director Dean Cameron Thursday, Verma said the agency has "reason to believe" the state would not be "substantially enforcing" current law by allowing the sale of proposed "state-based plans." Should any insurers offer these proposed individual-market plans, the CMS could impose civil monetary penalties on the insurer of $100 per day per subscriber, followed by a cease-and-desist order, Verma wrote. 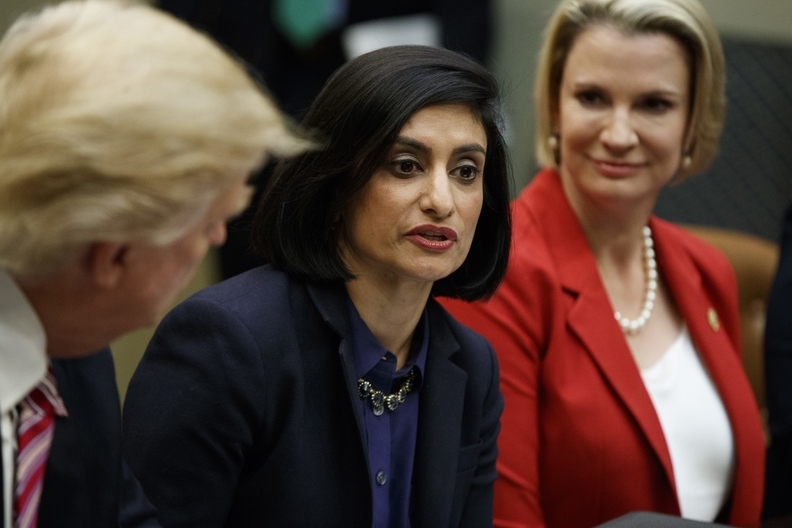 "We … recognize that states face unique challenges in repairing the individual health insurance market, and we are committed to working with states to provide the flexibility to do so," Verma wrote. "However, the (Affordable Care Act) remains the law and we have a duty to enforce and uphold the law." ACA supporters and some health insurance groups were guardedly relieved by the CMS' decision because they feared other GOP-led states would launch programs similar to Idaho's. They warned that allowing the sale of leaner plans that could charge much higher rates for older and sicker beneficiaries would create two separate risk pools, driving up premiums for people with costly medical conditions and potentially forcing insurers out of that market. It also was projected to increase the cost of federal premium subsidies, which are tied to ACA exchange rates. "We are pleased that CMS has chosen to draw the line at extralegal action," said Margaret Murray, CEO of the Association for Community Affiliated Plans, which represents safety-net insurers. "But we're concerned about the enthusiasm the letter seems to convey for short-term plans, which invite back the dysfunctions that inspired health reform to begin with." "If this decision had gone the other way, the door would have been wide open for states to subvert the ACA in all kinds of ways, and I think a lot of red states would have done that," said Larry Levitt, a senior vice president at the Kaiser Family Foundation. Blue Cross of Idaho did not respond to a request for comment by deadline. Idaho Insurance Director Cameron said Friday that the department is reviewing the letter. "We do not read the letter as a conclusion nor a decision," he said. Cameron said in a January interview that the state-based plans were needed to stop the rapid loss of healthier people from his state's individual market due to unaffordable prices for ACA marketplace plans. "That's what state-based plans are trying to address, those healthy individuals leaving the marketplace and taking the risk on other approaches or going without insurance altogether," he said. "We're offering plans that meet most of the ACA's criteria and we're hoping to improve overall health of the risk pool." In January, Gov. Otter issued an executive order asking Cameron to develop "creative" options to expand choice on the exchanges. Cameron later that month issued guidelines for the new "state-based plans" that would allow insurers in Idaho to get out of some ACA rules as long as they offered ACA-compliant plans as well. Under Idaho's proposed model, insurers would have been able to sell plans with 50% higher premiums for people with pre-existing conditions; exclude coverage for pre-existing conditions for people who had a gap in coverage; vary premiums by 5-to-1 based on age; exclude coverage for some ACA essential benefits such as maternity care; and set a $1 million annual cap on benefits. All these features are prohibited by the ACA. Last month, Blue Cross of Idaho announced that starting in April it would sell five individual-market plans, which it dubbed Freedom Plans, under the state-based plan model. It estimated there were about 110,000 middle-class, uninsured Idahoans who might be interested in buying these plans. Other insurers selling plans in Idaho held back, however, expressing wariness about violating the ACA's coverage rules. Idaho officials and Blue Cross of Idaho argued that HHS could allow the state-based plan model even though the plan benefits were not compliant with the ACA's statutory requirements, because states have discretion in how they enforce federal law as long as they "substantially enforce" it. But Verma's letter said her agency has "reason to believe that Idaho may not be substantially enforcing" the ACA's Part A market requirements on insurers. Under the Public Health Service Act, she said, the CMS must enforce those requirements once it determines the state is not substantially enforcing them. Tim Jost, an emeritus law professor at Washington and Lee University who is an expert on the ACA, said that ends that. "I cannot imagine that a sane Blue Cross plan would issue policies in the face of $100 a day fines per enrollee," he said. "Gov. Otter and Director Cameron probably are not too happy. But I think this is pretty definitive." Still, Verma pointed to the proposed rule published Feb. 21 that would expand the availability of short-term plans by letting insurers sell plans lasting 364 days, up from the 90 days currently allowed. "We believe that, with certain modifications, these state-based plans could be legally offered under (the Public Health Service Act) exception for short-term, limited-duration plans," she wrote. "I encourage you to continue to engage in a dialogue with my staff regarding this and other potential options." That worried some insurance groups. "We continue to have concerns regarding extending short-term plans beyond short, discrete time periods," said Ceci Connolly, CEO of the Alliance of Community Health Plans, which represents not-for-profit insurers. "We hope that future discussions with Idaho or other states will strive to provide adequate coverage." Meanwhile, a second state moved ahead this week with an effort to allow the sale of cheaper, noncompliant health plans. The Iowa Senate passed a bill to let the Iowa Farm Bureau Federation sell noncompliant plans that would allow screening for pre-existing conditions. The plans would be insured by the state's predominant carrier, Wellmark Blue Cross and Blue Shield. Jost said the Iowa initiative could sidestep the legal problem Idaho faced because the Iowa Farm Bureau Federation is not a licensed health insurer, and the ACA rules only apply to licensed insurers. Tennessee already allows its state Farm Bureau to sell plans that use medical underwriting. "But there are some questions, because Wellmark would be administering the plans, and they are a licensed insurer," Jost noted. This is the second consecutive blow to Idaho officials who had planned a two-pronged effort to lower premiums in the state's individual market. Just last week, the state Legislature spiked a bill that would approve an application for a dual Section 1115-Section 1332 waiver to move chronically ill patients to Medicaid and set up a reinsurance pool for the exchanges. Many observers had wondered how HHS Secretary Azar would come down on the Idaho question. Last month, he told senators that, "We have a duty to enforce the law as Congress has written it." Since then, however, he had refused to make any direct statements about Idaho's challenge to the ACA. "It wasn't necessarily clear that the federal government was going to stop states like Idaho from flouting the ACA's insurance rules," Levitt said. "With the new secretary in power, this does lay down a marker that it looks like HHS is going to enforce the law." An edited version of this story can also be found in Modern Healthcare's March 12 print edition.